I had a fun hot chocolate party at my house this week, and I can’t tell you how wonderful it was to have friends over for yummy food, chatting, relaxing, and hot chocolate–especially after the really crazy fall our family had. The Christmas season can get just get overwhelmingly busy, and this year I decided to make a conscious effort to slow down and enjoy the things that matter most to me. I’m so glad I did, and we had a fabulous time. 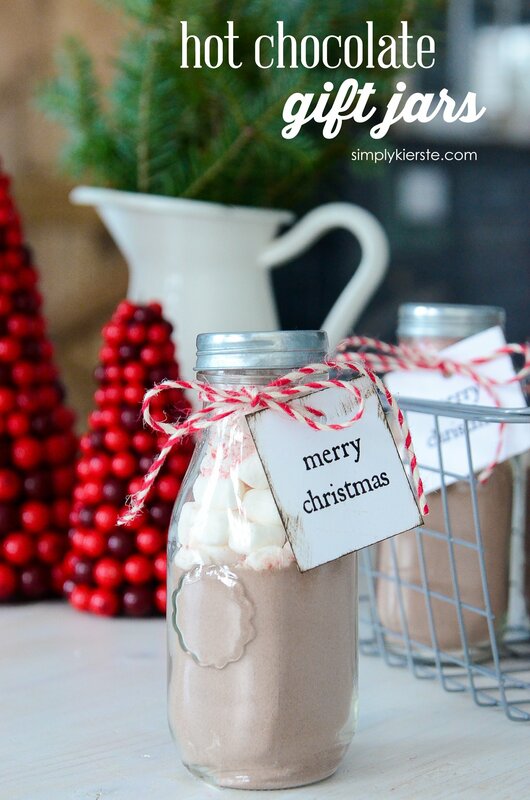 I made these cute Hot Chocolate Gift Jars as favors and Christmas gifts for my guests, and I thought I’d share them with you too! I used milk bottles, but you could use mason jars, or even clear treat bags if you wanted to. Layers of hot chocolate mix, marshmallows, and crushed peppermint fill the jar, then a cute tag is tied around the top with baker’s twine…in just minutes you can have an adorable gift that’s perfect for teachers, friends, neighbors and more! They are super cute and super easy…two of my favorite things! Add marshmallows nearly to the top, then sprinkle in crushed peppermint. You can buy it already crushed, or fill a bag with candy canes and pound them with a rolling pin. I’ve done both, they both work! Print the tag onto white cardstock, distress the edges if desired, punch a hole in the top and tie it on with baker’s twine or ribbon! Such a great idea!! I would love to receive this as a gift! I need to make a few for last minute gifts. Where did you find the lids for the bottles? These are absolutely adorable. Can I ask you how do you distress the edges on the cardboard tags? It gives it such a nice look…Thank you and Happy Holidays! Thank you for your reply, i searched that on amazon already. But I’m still confused as to how exactly you apply it? Do you use a pen or some sort of brush? Thank you again! It’s basically an ink pad, and you just hold it in one hand, paper in the other, and run it along the edges of your paper! Super easy. Thank you so much, greatly appreciated!